I should probably warn you. I'm a little annoyed. If you love this book, don't come throwing hammers at me, please. (People do that, right?) I'm not saying it's a bad book. I'm not even saying I wouldn't enjoy it in another age. But the fact is, I must ask: Why, Kathy Reichs? Why? Why did you feel the need to take a great crime series and spin it off? Well, I can answer that with one word (hint: it's "money") but it still makes me sad. The Temperance Brennan books are great. Well, I haven't read them personally, but my mom adores them and I'm addicted to the TV show. And what bugs me is that the original series is a realistic crime series with realistic crimes and no mention of superhero-causing parvoviruses. Aka, what I think happened here is someone thought, hey! Let's give Temperance a niece and write a series, because if we link it to Bones then people will want to read it. And that's not fun enough so let's make them virus-enhanced animalistic super-beings. Yeah, sure, give Temperance a crime-solving niece. I will still be a little peeved because I think spinoffs for the sake of name-recognition are annoying (though marketing-wise, savvy). But really? Did she have to be a crime-solving super-niece? It would be one thing if the original Temperance books had science-fiction elements ala Dresden Files. But, um, they don't. So now we have this weird universe clash where Temperance lives in the real world and her niece is somehow in this other world where things like superpowers exist. Maybe I'm just nitpicky, but the genre-switch brings up all sorts of universe problems for me. So I ask you all: what do you think of spinoffs of popular series? That change genre? 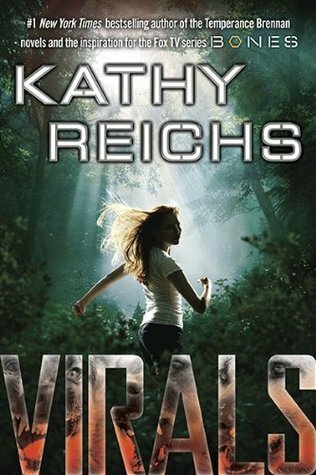 What do you think of Virals? Would you read it? Especially interested to hear from fans of Reichs' other work, but I'd love for anyone to weigh in!